An excellent vet anesthesia ventilator, it has pressure and flow sample and display and has the alarm function. 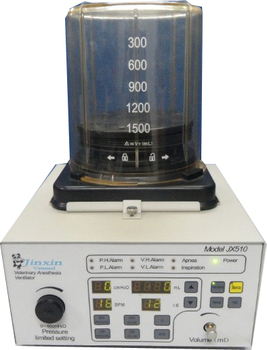 JX510 veterinary anesthesia ventilator is an excellent vet anesthesia ventilator, it has pressure and flow sample and display and has the alarm function. It has pressure limited protect function. It is used with the vet anesthesia machine well. The main unit of JX510 Veterinary Anesthesia Ventilator, one unit adult bellow(0-1500ml), one unit 0.3 meter silicon tube, one unit 1 meter silicon tube, one unit 4 meter gas source pipeline, one unit flow sensor with cable, one unit pressure sample tube, one unit power cable. Pediatric bellow(0-300ml)is option.